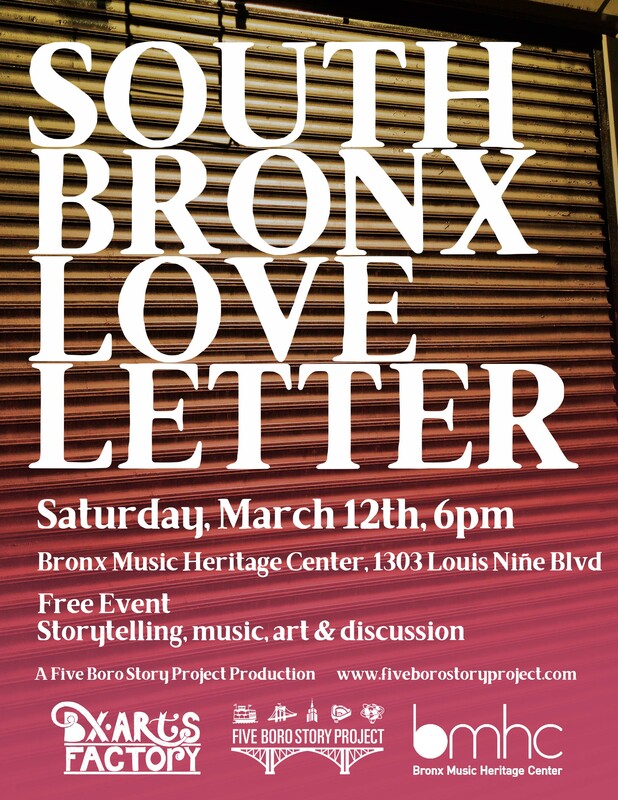 South Bronx Love Letter is a series of workshops and community events that showcase storytellers, artists, and community members sharing their love for the Bronx through true life stories, poetry, music, and art. As the South Bronx faces rezoning, gentrification, and rebranding, this series aims to affirm the stories of people who have been living in the South Bronx and pouring their love into it, putting forward an image of the Bronx as defined by long-term residents. Join us for an evening of art, musical performances and community discussion centered on the immigrant experience and Bronx love. Artist Zero Prophet will perform original songs inspired by the Bronx and by Joe Hill, a Swedish immigrant, songwriter and labor activist, and recount stories from his own experiences growing up and creating art in the Bronx. Following the performance, all attendees are invited to share stories, memories, and ideas in a story circle, and contribute a love note to the Bronx on our “South Bronx Love Letter” interactive station. This event is presented in conjunction with BxArts Factory‘s art exhibit “Memories Un-Remembered,” a collection of visual stories exploring immigration, nostalgia, displacement, adaptation, and gentrification. The Bronx Music Heritage Center Lab is located at 1303 Louis Niñé Blvd. Take the 2 or 5 trains to Freeman Street, or the BX 19 bus. View “South Bronx Love Letter: Part 1″ photos HERE. THE FIVE BORO STORY PROJECT and its logos are trademarks owned by Bridget Bartolini.